Recent conversion 2003, fully equipped centrally heated, large 2 floor (6 x 6 metres) one bedroom gite sleeping 2 adults and 3 children. Large garden 1000m2 shared with other gite, inc child swing, table tennis, badminton and football goals Private terrace with fixed charcoal BBQ and use of on site owners heated pool 10m x 5m and 1.8m deep in fenced pool area of 400m2. The pool, used by BOTH gites, can accommodate 5 or 6 adults children easily, and is equipped with Situated in small village 10 miles from Mortagne au Perche, in quiet surroundings. Big Super U supermarket 10 mins away. Owned by a British resident family - plenty of bird watching, without moving from your terrace, families of buzzards, and red squirrels in the garden, fishing available in local lakes and rivers, and cycling and forest walks. Le Mans 24hr course 1 hour away. Equestrian centres 1 and 5 miles, go kart track for kids and big boys 6 miles away. Laserquest and Paintball in nearby Alencon. Flexible changeover day, by arrangement with owner, and possibility of 8, 9, 10 day holidays - to take advantage of cheaper midweek ferry tunnel fares. See also our other 2 bedroom gite The Cottage at same location reference 730812. Free WiFi is available on site plus free hotspots in nearby Mortagne or Alencon. Sample our home grown cider, and visit our orchard with the flock of Ouessant sheep, with our hand-reared lamb ''Cutlet'', who likes to play football. 2015 - Full size table tennis table in shelter. The gite is typical norman style - with exposed beams downstairs and upstairs, and pierre apparent (exposed stone) walls upstairs, tastefully converted in 2003 from old stable. It is fully centrally heated so is fine for winter lets. We offer complimentary coffee, tea, milk and sugar (along with a bottle of local cider on arrival for all bookings of 1 week or more) . Downstairs: Fully equipped kitchen with washing mc, gas cooker, fridgefreezer microwave and dishwasher, plus kettle toaster and coffee machine with all utensils. CD radio player. Dining area with seating for 6. Gas central heating and hot water. Separate shower room with washbasin and wc. Upstairs: A large 6 x 6 m bedroom, sleeping family or friends 2 + 3 - with double bed and childrens bunk beds and a spare bed (adult or child) Seating area with DVD player and screen. Outside: Private patio to rear with table and 6 chairs and parasol, with brick built barbecue and tools. Swimming pool (20 metres from gite) Tenants have use of owners private heated 10 metre pool open May - Sept equipped with sun loungers and parasols. Shower room with shower cubicle, wash basin and wc. Hair dryer provided. The pictures don’t do it justice! We loved it! Perfect for our family stay. Heather and Alan were very welcoming. The children loved the pool and I loved that it had a great shower! 5 very happy people! What a wonderful holiday we just had with our two young boys. The house is spacious, inviting, so clean and neat and the hosts are wonderful. Everyday was fun and relaxing and we couldn't have asked for a better home away from home. Thank you Alan and Heather for a fantastic gite! We booked a very last minute getaway to this cottage and I'm so glad we did. We received an almost immediate confirmation from the owners which made our planning much easier. Everything was clean and lovely and it came equipped with everything we needed. The wifi was an added bonus, and everything worked as it should have, everything was modern and easy to use. Will definitely be returning in the future! Village is very peaceful and quiet. Gite has been nicely restored and equipped with all the essentials. Alan and Heather, the owners, were very helpful. Nice swimming pool, that kept the children happy. Clean and well equipped little Gite, lovely friendly owners, situated in a quiet and beautifully kept village. We enjoyed our stay. 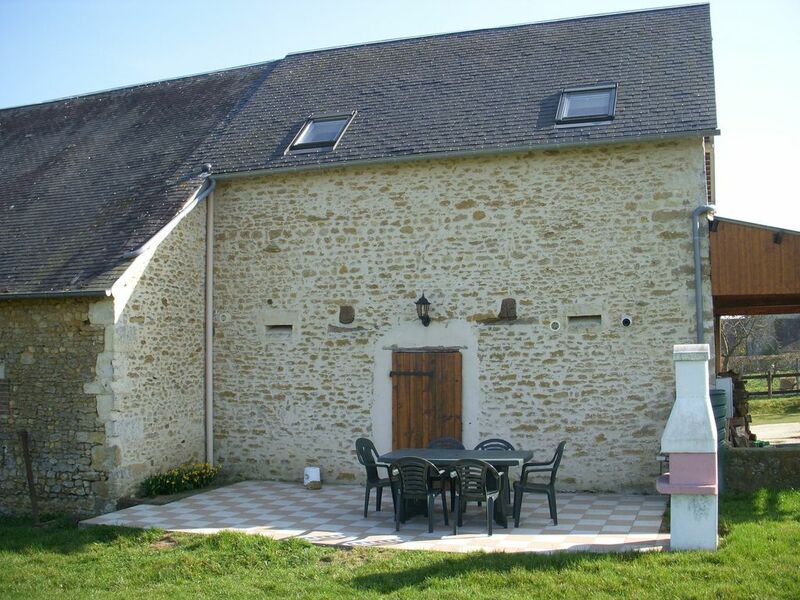 This is a well equipped gite with a lovely pool. It is in a small hamlet in a quiet, but interesting part of Normandy. We found lots to be without having to travel far. The only downside was the the WiFi. Yes, there is some, but only outside on a bench in front of the owners house. Not great when raining. Maybe an issue with teenagers ! If you are not worried by the Wifi issue then a great gite. I would stay again. Sorry you had a problem with the WiFi signal, and were inconvenienced. The other gite, The Cottage, is closer to the transmitter and extender, and always get wifi signal in the kitchen and bedrooms. Lakes with leisure facilities open summer - 5 and 10 miles away. Horse riding and full tuition at farm equestre centre 6 miles. Forest walks and birdwatching - large buzzards a regular sight overhead, harriers and hoopoes also seen along with red squirrels and other natural fauna and flora. Easy to visit the D Day beaches about 1.5 hours (Sword) or 2 hrs (Omaha Utah)drive away. Plenty of local markets available everyday of the week (more like UK farmers markets but with a french flair) Swimming pools with flumes etc 10 and 15 miles. Go kart track rally cross course (suitable children as well as bigger boys) Essay 5 miles. Le Mans 24 hr course and museum 50 miles.